As Apple continues to refine its in-house mapping and navigation services, business owners are reportedly receiving phone calls from Maps team representatives looking to resolve user-submitted data discrepancies. According to a post on Reddit, Apple's Maps team is reaching out to business owners to clarify reports of incorrect address data assumedly sent in through the Maps app's "Report a Problem" feature. A 408 number called me from Apple Maps and let me know that a user reported my business address as incorrect. They still had my old address that was listed on Yelp so I gave them the new one. I asked when I should expect it to be updated on Apple Maps and the lady said, "We don't have an exact timeline for updates but it should be within the next week." The "408" area code covers Cupertino, Calif., along with neighboring cities in the counties of Santa Clara and Santa Cruz. Although the Maps team appears to be contacting individual businesses, it is unclear if Apple is also making calls to other points of interest like schools and apartment buildings as reports affirming such action have not yet surfaced. Also unknown is the process by which Apple prioritizes the "Report a Problem" corrections. It can be assumed that the Maps team receives a large volume of correction requests per day considering the app has been deployed worldwide and is now available on OS X as of 10.9 Mavericks. If the Reddit user is to be believed, Apple is achieving a quick turnaround of one week for each reported incident. The information jibes with a report last week that claimed Apple is now updating the Maps app with user-generated corrections on a daily basis. 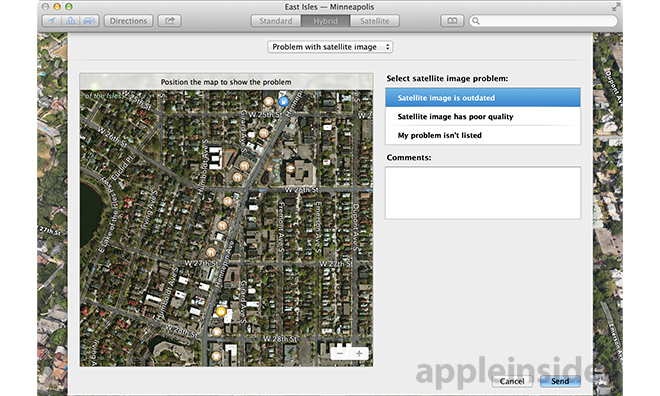 Since its 2012 introduction in iOS 6, the Maps service has endured a barrage of criticism over inaccurate map data, The rollout was so ill received that it prompted Apple CEO Tim Cook to issue a formal apology to customers and was said to be play a role in the ousting of former iOS chief Scott Forstall. Following the rocky start, Apple acquired a number of mapping and navigation companies including Embark, HopStop, Broadmap, Locationary, and Spotsetter to bolster Maps' feature set. Despite its efforts, Apple's Maps app still suffers from inaccuracies and lacks functions like built-in public transit directions that have long been available through competing services, namely Google Maps.